it's really getting me into the mood. 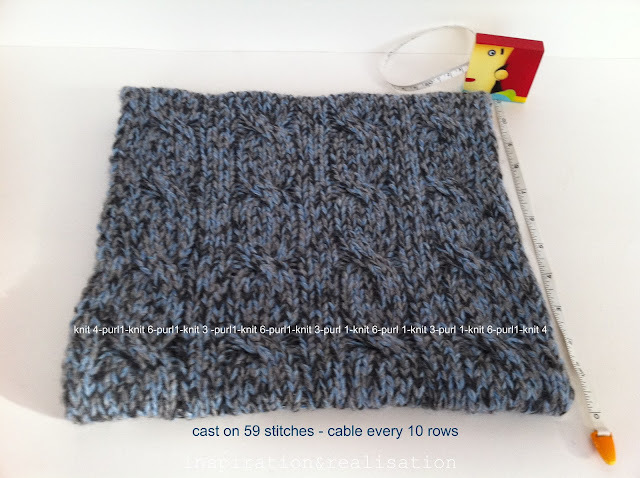 #2 - I have few more pieces of clothing that are actually "new"
Because I wanted a fast knit, I joined together several leftovers until I've got it right to be knitted with 6 mm needles. * and keep knitting, following the pattern on the picture above, for about 21"
Ok, I can totally do this, except the cabling. I need to learn that and then possibly I could totally make this!! Your choices of yarn are perfect. They work beautifully together. And I love your tape measure. A diet that bring new clothes is a good thing! How do you find time to knit when you are packing up your life??? I just completed a crocheted, bulky circle scarf! I was in the mood for something I could complete right away and that fit the bill. Love the feeling of completing something. Your scarf is very cute! Now that is pretty. I love the combination of colors you used. Looks so pretty! I love challenging myself and learning how to do new things! This is so pretty!! I am very new to knitting and currently taking classes. I haven't learned to cable yet, but, can't wait to learn. TFS!! I love the combination of yarns. 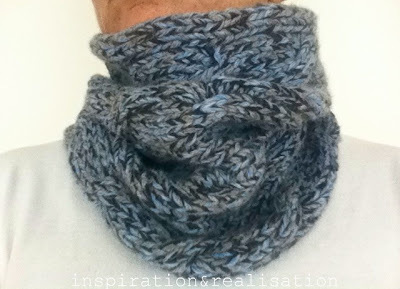 I just crocheted a cowl. I can't wait to wear it. Yours is lovely. This turned out great! Would you share it here? So pretty! I used to know how to know... I forgot! Fabulous idea! Great job. Thanks for sharing. Love this idea but I really need to learn to cable first! This is creative and cute, I'm going to gave it a try..love it.. Very nice! I never think to mix my yarn together like that ... I'm going to look at my stash pile in a whole new way! beautiful! Saw this on Tip Junkie, makes me wanna knit! 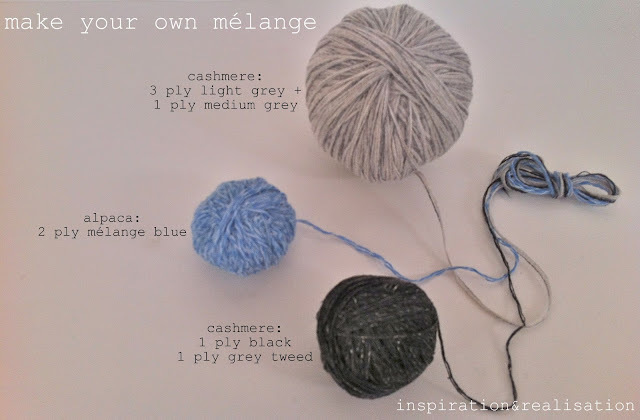 very nice, love the melange! I keep saying I'm not buying any art supplies until I use up the stash, but it's so hard! thanks so much for sharing on Craft Schooling Sunday! found your post via tipjunkie. come visit anytime and follow if you like what you see!